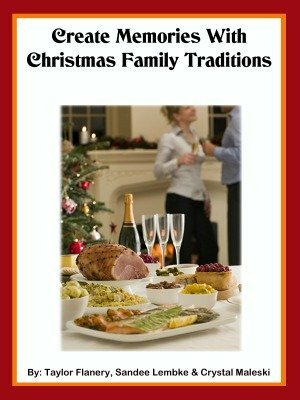 I've created (with a couple of my friends) a free ebook with ideas for family Christmas traditions you can do this holiday season to make special Christmas memories that last a lifetime. To get it all you have to do is be a Household Management 101 newsletter subscriber. Are you already ready to sign up for your newsletter subscription? Then, click here to sign up now and you'll get your newsletter containing a link to the free book each week during the Stress Free Holidays series. I love my readers, and I wanted to give each of you a little Christmas gift from me. That's why I teamed up with two of my best blogging friends, Sandee Lembke (of Theme Party Queen) and Crystal Maleski (of Make Dinner Easy) to share with you our favorite Christmas family traditions, and inspire you with ideas you could do this year yourself with your family. So, how did we get this idea? Well, Sandee, Crystal and I started talking about what we thought was the most special part of the Christmas season, and quickly realized we loved all the Christmas memories with our families, things we do with them year after year. That's what inspired this book. It shares some of our most treasured family Christmas traditions, along with family recipes, do it yourself decorations, and suggestions for prioritizing which activities to do this year with those you love. We hope it inspires you to choose some activities to do with your family members this year, since that is one of the best parts of the holidays. Everyone who is a newsletter subscriber of Household Management 101 will automatically get a link to a password protected page on the site which contains the link to this ebook to download within the weekly newsletters sent to your inbox during each of the weeks of the Stress Free Holidays series, which begins this year on October 4, 2014, and runs all the way through Christmas. If you're already a newsletter subscriber you don't have to do anything else to get your free copy, except open your newsletter on one of these dates and claim your book. If you're not a newsletter subscriber yet, it's not too late. Go ahead and sign up below and you'll begin getting newsletters and can claim your book during one of the weeks it is sent out. Here's what you have to look forward to in this free ebook gift. I hope each of you enjoy your free Family Christmas Traditions E-Book, and make cherished Christmas memories this year with your family that you'll treasure for years to come.